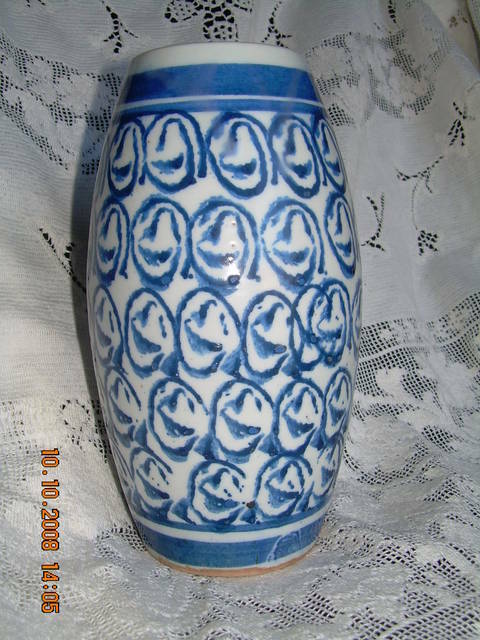 A Fine Ming Porcelain Cacoon Shape Vase Wanli/ Tianqi (1573-1627),Painted in Underglazed Blue with a Reapeating Buddhist/Daoist Symbol. This Ming Vase is a Great Find for Any Collection! The Unglazed Parts: Foot Rim, Inside the vase, Ect, all Flesh Color Red with a Natural Soft Glossiness, that Shines Like Glass. 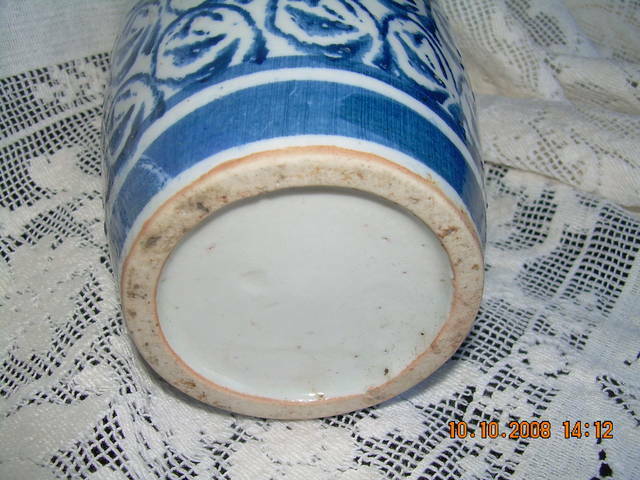 The Glaze surface has Bubbles, Bursts, & Near Rim there is a Creeping Glaze Spot, All of these Attributes are Characteristic of The Wanli Period, Ming Dynasty. Size: 16cm(6 1/4" Height) From Private Colllection in Gettysburgh, Pa. This Ming Vase Come with Certificate of Authenticity. ~ "I WILL CONSIDER ALL OFFERS" ~ I Will Be Glad Send More Pictures or Answer Any Questions. Thank You for Your Interest & God Bless -Sincerely Rob A. You have made an extraordinary claim for this vase (Wanli). Can you point us to another example, that leads you to this conclusion? i.e. a book or online reference. The foot rim, hue of the cobalt blue, lack of bristle holes in the base, shape and motif all make me think this vase dates no earlier than late 19th cen. and probably is from the mid 1960's. In addition, I would think perhaps it is actually Korean. I'm am always willing to admit I am wrong, so prove me wrong. 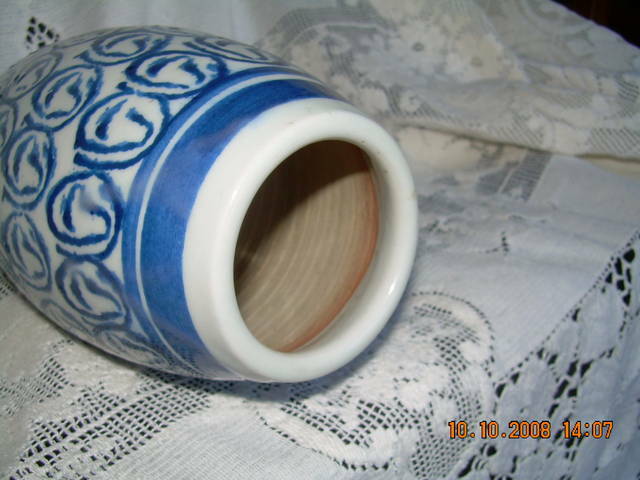 In the mean time, I will post, from my collection, a typical (other than it's size) Wanli Kraak vase in this section. It is not for sale. Also, I read Your Post/Opinion, about my Ming Vase, I just want you to know,& I run my Business & Treat My Customers with the Uttmost, Intergrity & Honesty. When I purchase Things for resale, I always fully Research them, Sometime I won't sell a Piece for a Month, or two, I have had pieces for a year, before I Knew without a doubt what I was selling. Also, The Style of my Ming Vase is called a Cacoon Style, it has been used since the Yuan Dynasty(1271-1368). 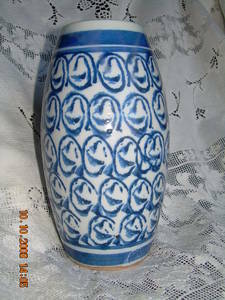 Here is the link to an Example of An Authentic Yuan Dynasty Junyao Vase in Cacoon Shape(1279-1368) http://www.cicadaasianart.com/gallery/Category/5/Item/305/. The Color of the Blue used on My Vase is not the exact color That is shows in my Pictures, those pictures are terrible, I will putting on newer ones, here is one more site about Kraak Ming export Pieces, here is another Link, His Name is Warner Troesch and is an Authority on the Ming, Kraak, Export, referred By Jan-Erik-Nilsson, of gotheborg.com. Link is: http://gotheborg.com/links/links-index.htm (then click on KRAAK PORCELAIN, A COLLECTERS GUIDE by Warner Troesch).